I have a rule about eating at restaurants: I only order dishes that I can’t make easily at home. These Stovetop Ribeye Steaks with Compound butter are the reason that I haven’t ordered a ribeye steak at a restaurant for years. They’re so good that no restaurant ribeye compares! But they’re not just delicious, they’re also super easy to make. You won’t need your oven to prepare these Stovetop Ribeye Steaks with Compound butter. Instead, you can prepare it solely using your stovetop in about 15 minutes. 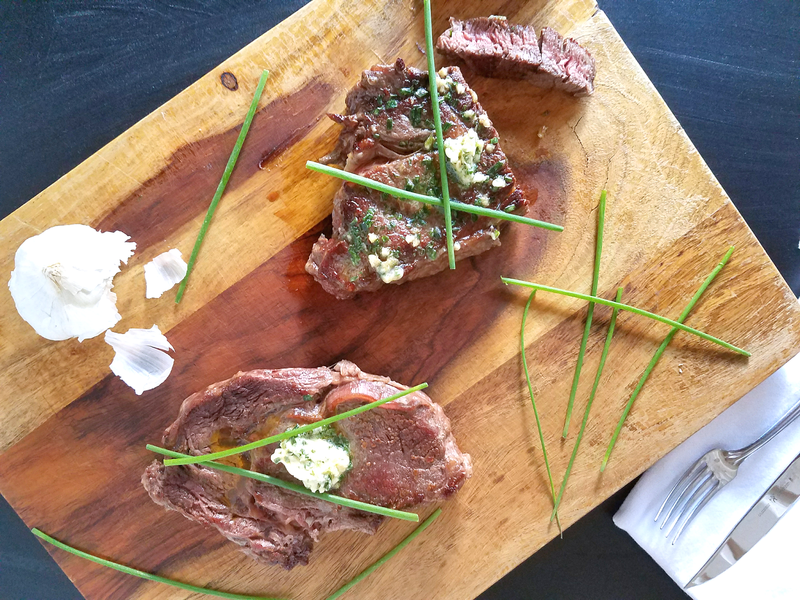 I used organic, grass-fed ribeye steaks for this recipe and I highly recommend that you do too. Beef from grass-fed cows is better for everyone – humans, cows and the environment. It’s better for you because it has less of the saturated fats that researchers claim are connected to elevated cholesterol and more of the things that are good for you, like omega 3 fatty acids, conjugated linoleic acid (which has been associated with reduced cancer risk and weight loss), and the precursors to vitamin A, vitamin E, and antioxidants glutathione and Superoxide Dismutase (source). Overcrowding, unsanitary conditions, and substandard feed contribute to health problems. This intense confinement of cattle increases the risk of bacterial infection, so injectable antibiotics and hormones are used to keep them healthy and get them to slaughter weight. So, letting cattle eat grass is better for cows and produces meat that is better for you. What about the impact to the environment? Although there is no unequivocal answer yet, Oregon State University shared a study indicating that small, well-managed farms that let cows graze are better for the environment. The grass that the cows graze on pulls enough carbon dioxide out of the air to partially offset the methane produced by the cows. In addition, a well-managed grass-fed cattle operation rotates the cattle between fields, reducing soil erosion and the concentration of waste that runs off into the ground water. 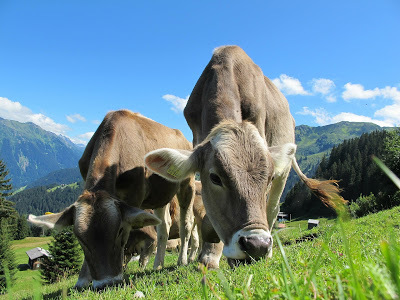 The land that small farms use for grazing is also land that is not typically suitable for growing crops, which makes unproductive land purposeful. And don’t forget, using less antibiotics and hormones is inarguably better for the environment. The reason grass-fed beef is pricier has to do with beef producers’ profit margin: It can take a farmer up to a year longer (and an extra year’s worth of food, care, and labor) to get a grass-fed animal to reach slaughter weight than for a conventionally raised one. Grass-fed cattle also tend to be smaller at slaughter, so there’s less meat to sell per head. More expensive or not, there are too many benefits of grass-fed beef to ignore, such as the impact to the environment, healthier cows and a better nutrient profile of the meat. The same Consumer Reports article cited above found that ground beef from grass-fed cows “is less likely to harbor superbugs—bacteria that are resistant to three or more classes of antibiotics [such as E. coli].” Need I say more? I also use ghee and butter from grass-fed cows for the same reasons. I buy my ghee at Natural Grocers and my butter at Costco (Kerrygold brand). To make ribeye steaks from grass-fed cows affordable, I buy my grass-fed, organic ribeye steaks at Costco. A pack of six 10-oz steaks only set me back about $45, which is a steal! I’ve also seen grass-fed ribeye steaks available for sale at a reasonable price at Walmart, believe it or not. Natural Grocers also sells a few different brands of grass-fed steaks. Their steaks are generally more expensive than Costco or Walmart, but they conduct random audits on their producers, making them the place to shop if you are concerned about animals being treated humanely. Don’t forget that you need a good pan to cook your steaks in! I have been using a Calphalon Unison 12″ Griddle Pan for about 5 years now and love it. It has held up to heavy use and is still going strong with no sticking and easy cleaning. I’m a huge fan! 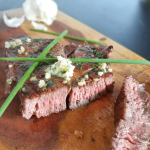 Since I’m encouraging you to cook a ribeye steak from a grass-fed cow, I feel compelled to explain the how that steak my be different from a conventional steak and how to cook it so that your steak turns out tender and flavorful. Meat from a grass-fed cow tends to be lower in fat, which makes it susceptible to drying out and getting tough. Because of this, the most you should cook a grass-fed steak is medium. A grass-fed steak should never be cooked until well done! And of course, because I am telling you this, I also need to tell you that consuming raw or undercooked meat increases the risk of foodborne illnesses. Regardless, I prefer my steaks medium-rare. Two additional things to remember. First, let your steaks rest for about 5 minutes after removing them from the heat. It will allow the juices to redistribute, ensuring the juiciest, most tender steak possible. Second, the steaks will continue cooking after they’re removed from the heat, so pull them off slightly earlier than you would for a steak cooked to your level of perfection. The last and I think most important tip for cooking a killer steak is to smear butter on the top while it rests. The Compound Butter in this recipe is a perfect example. It adds moisture and flavor that makes the steaks melt in your mouth! I like to serve these stovetop ribeye steaks with my mashed cauliflower. It also can be prepared in about 15 minutes, and together they make a delicious meal that is gluten-free, grain-free, low-carb, keto and Primal. 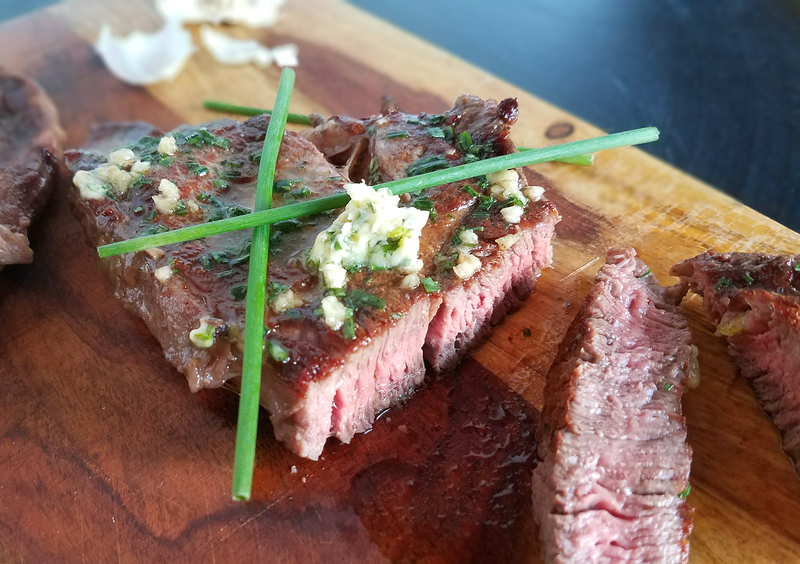 This Stovetop Ribeye Steak with Compound Butter makes a juicy, flavorful steak about as easy as possible! No oven necessary since this steak is cooked solely on your stovetop. Discussion of grass-fed vs. grain-fed beef included. Prepare the steaks by removing from the packaging and patting dry. Sprinkle each side with salt and pepper. Add the ghee to the pan. Once melted and hot, add the steaks. Cook for about 3-4 minutes on each side, or until both sides have some color and the steak is cooked until desired doneness. Remove the steaks from the pan and set aside to rest. While the steaks are cooking, mince or press the garlic into the butter and add the chives and salt. Stir well and set aside. Spread a tablespoon of compound butter onto each steak while it is resting. Serve once the steak has rested. Enjoy!